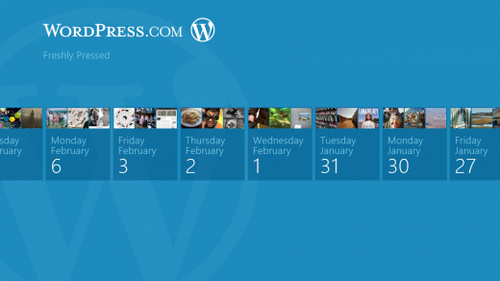 WordPress for Windows 8 is finally released by the WordPress. According to WordPress, its new app is now available for download on the new Windows Store. The app is developed completely in Metro style and also integrates some of the features of Windows 8. The most interesting fact about this app is its time of release which is perfectly in coincidence with Windows 8 Consumer Preview release. The app offers us an explicit look of how the apps might look after going through the unique filter of Microsoft’s new Metro interface. One can surely see a significant ‘horizontal’ feel in the entire app that offers content from its Freshly Pressed section. It is important to note here that the app is not actually a full-featured WordPress publishing tool for self-installs, but rather offers a way to browse content from WordPress.com and instantly reblog it. With the app, you will also be able to share photos links and quotes from any app on your blog. One can also opt for Windows 8’s “Semantic Zoom” feature, a feature primarily a version of “pinch-to-zoom” gesture available on tablet devices. If you already have the Windows 8 Consumer Preview, you can download the app here. However, if you still have to get your share of Windows 8 Consumer Preview, you can get it here.